Not many street foods present the best of what a country offers, but Tokyo’s innovative nature challenges that with a street market that welcomes foreign palates, offering a taste of both the sea and Japanese cuisine. 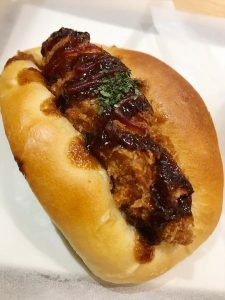 This cheese-crusted bun filled with potato salad is the perfect snack found near the Tsukiji market. This delicious pastry may not be sold in the market but is still close enough to the heart of Japanese street food. Hokuo Bakery awaits inside Shintomich Station with a collection of pastries unlike any other. The combination of creamy potato salad within a bun and soft cheesy crust make this the perfect breakfast or lunch time meal. This croquette wrapped in a bun taco is nothing but soft, deep-fried goodness found at the Hokuo Bakery in Tokyo’s Shintomicho Station. This croquette wrapped with a soft bun and drizzled with several savoury sauces is honestly a big question mark. But don’t fret, it’s normal for tourists to find themselves in this position when travelling. 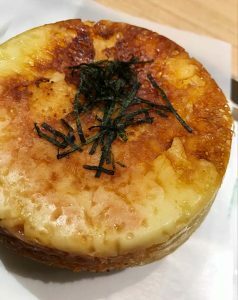 Although Hokuo’s English-translated website claims the deep-fried breaded filling is beef, it tastes like a rather soft, marinated mashed potato. Weird enough for you? Whatever it is, it’s delicious! Urchin and scallops on a stick may not be a usual sight but it is a popular combination at Tokyo’s Tsukiji market. Scallops and sea urchin are foods many people probably don’t think they’ll ever eat on a stick. However, it seems everything is possible in Tokyo. 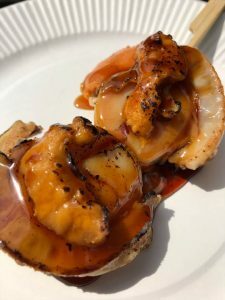 This seafood dish is barbequed then torched on top, giving it burnt edges that add a nice balance to the creamy texture of sea urchin and fresh scallops. The sauce that is both savoury and sweet is the perfect addition to leave you wanting more. This matcha-flavoured mochi and strawberry combo is the perfect balance of sweet and fresh fruit. Strawberry and mochi, or ichigo daifuku, are always an all-time favourite and a common sight in the streets of Tokyo. Daifuku can be found in train stations, specialty shops, food stalls and in the Tsukiji market. Mochi is a sticky rice cake and is popularly eaten in Calgary with an ice cream filling. This version of the treat is stuffed with a sweet filling—usually red bean paste—and is covered with a fine layer of potato starch and sometimes confectioner’s sugar or cocoa powder to keep it from sticking to your fingers. 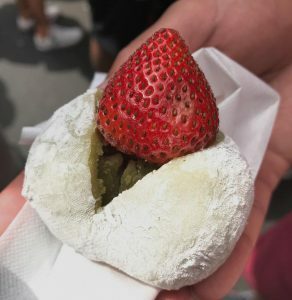 With each bite of ichigo daifuku, the juice from the strawberry cuts through the sweet, matcha-flavoured paste and the sticky exterior of rice cake. This dessert is quite unique, so don’t judge it until you try it! This oyster is one of the cheapest ones in the market because of its smaller size to the other catches of the day. You may not think this is possible, but oysters in the street are quite the spectacle. Fresh out of the sea, oysters are sold based on size. 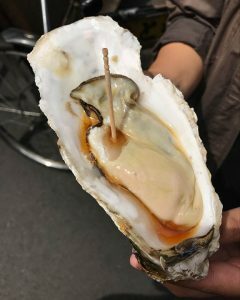 Since this oyster was one of the smaller ones in the market, it was worth roughly seven dollars, and prices could go up to nine dollars or more. That is crazy considering this oyster is bigger than my hand. Eaten with the aid of a toothpick, some people challenge themselves to eat it all in one bite, regardless of how difficult it may seem. Although dipped in sauce, the freshness of the oyster still shines through and is every seafood lover’s dream to eat. But if you are not a fan of the creamy texture of oysters, you might want to steer clear of this one. 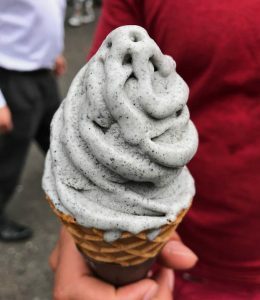 Tsukiji market’s black sesame soft serve stays true to the burnt and nutty taste of black sesame seeds. In Calgary, a few food stalls and shops serve charcoal activated ice cream. This soft serve may look like the lighter version of the dark treat, but is far from it. Sesame, which is quite popular in Asian cuisine, makes all the difference for this dessert. Although nuts are commonly paired with ice cream, the burnt and strong, nutty flavour of black sesame seeds makes black sesame ice cream quite unique from the more typical peanut, hazelnut or almond and ice cream combo. Tokyo is one of those places everyone should go at least once in their lifetime. It is a place people often find themselves eating foods that words cannot explain. Japan is a place to try new things, explore and get lost. Google will always be there to help you find your way back home—or at least back to your Airbnb, hostel or hotel.